"Victoria, I think this is one of those instances where discretion is the better part of valour: Jamie has an idea!" And we're onto disc 3 of Doctor Who - Lost In Time! 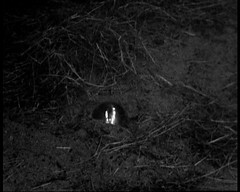 Episode 2 of The Abominable Snowmen may be my favourite surviving episode of sixties Doctor Who: Great location work, superb dimly lit studio sets (and we'll see much later how important decent lighting is when it all goes wrong in the 80s), good monsters, a sinister presence and even little stuff like the spheres communicating with each other and the moving one at the feet of the Buddha. The plot ticks along nicely in this episode resolving certain aspects of the first episode and introducing new elements, notably the master Padmasbhava. This episode works superbly and makes me wonder how much better episode 1 would be with the pictures. DOCTOR: I think not. I think there must be some sort of internal timing mechanism. Jamie, I hope you made those ropes secure. JAMIE: Oh, the King of the beasties himself couldnae get out of that one. Which is the Cybercontroller's cue to burst through the rope and the machine! DOCTOR: Jamie, remind me to give you a lesson in tying knots sometime. JAMIE: Are you all right? VICTORIA: That horrible thing. What was it? JAMIE: I don't know. Did you see what it did to my sword, though? Broke it like a piece of wood. No human's as strong as that. VICTORIA: What is this place? And what are those? JAMIE: Some sort of metal. They're all glowing. VICTORIA: Oh, let's get away from here, Jamie. JAMIE: Aye, if we can. I don't think that tunnel's completely blocked. Come on. JAMIE: Oh, don't worry about that, it's quite dead. Sure enough just at that point the Yeti trapped under the rubble starts to stir! Effectively these two scenes are setting up this exchange later in this episode. 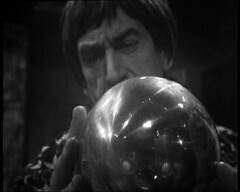 JAMIE: Hey, Doctor, if you really want to capture one of these beasties, I think I have an idea which might just work. 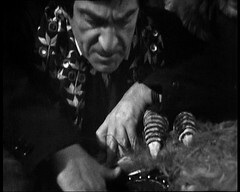 DOCTOR: Victoria, I think this is one of those instances where discretion is the better part of valour. Jamie has an idea. Come along. DOCTOR: You were right about one thing, Victoria. This creature certainly doesn't seem to be flesh and blood. DOCTOR: It's not your abominable snowman either, Travers. Look. It's metal. DOCTOR: No, I don't think so. It's more like a robot. TRAVERS: A robot? My dear chap, don't let your imagination run away with you. DOCTOR: Now, why has it stopped? Wait a minute. Wait a minute. DOCTOR: No, but there has been. 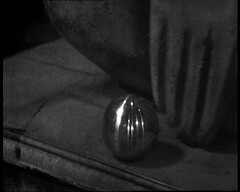 And we've seen what does fit in there: one of the spheres like the one Jamie took from the cave earlier in the episode! "You were right about one thing Victoria — this creature certainly doesn't seem to be flesh and blood". The audio is missing for the first half of the sentence until the middle of the word Victoria. The fault was disguised for the VHS release but is patched using other surviving Troughton dialogue for the CD and VHS releases. 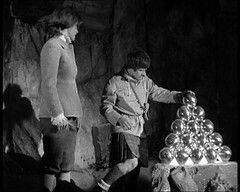 This scene then leads to the dislodged control sphere, stuck in the mud outside the monastery, communicating with it's abandoned duplicate left lying by the Buddha statue which then starts to move! Abominable Snowman 2 is the only episode of this story to exist. It was returned to the BBC in 1982 from a collector named Roger Stevens via Ian Levine. Stevens had bought a number of films from a former BBC employee who had "acquired" them. Levine asserted the both Snowman 2 and another episode, Invasion of the Dinosaurs 1 were missing from the archives. Levine returned the copy of Snowmen 2, but held on to Invasion of the Dinosaurs 1 for a little while longer, as a potential bargaining chip is any other sources of missing episodes emerged. That was returned to the BBC in mid 1983. See pages 195-9 of Wiped! Doctor Who's Missing Episodes by Richard Molesworth for more details. 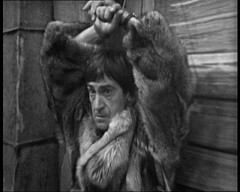 Abominable Snowman 2 was released on video as part of Doctor Who - the Troughton Years in 1991 along with Enemy of the World 3 and Space Pirates 2. It's by some distance the best episode on the tape. 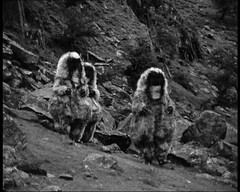 A second surviving Yeti episode, The Web Of Fear 1, would have to wait many more years for it's VHS release in 2003 as part of the final Doctor Who VHS release. 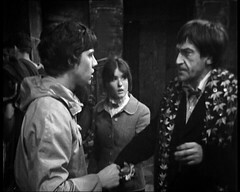 Both episodes can be found in the Doctor Who - Lost In Time DVD set.